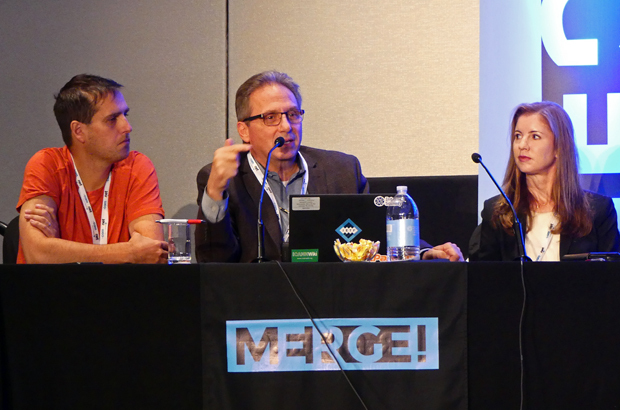 The inaugural edition of the Merge! 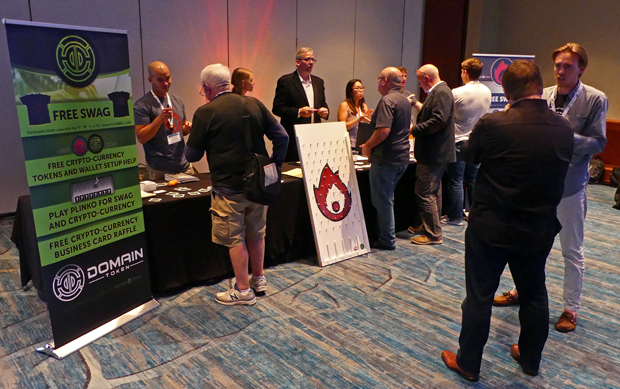 conference continued Sunday (October 15, 2017) at the Orlando World Center Marriott in Florida with a full slate of business sessions and social activities that stretched from 10 am until well past midnight. 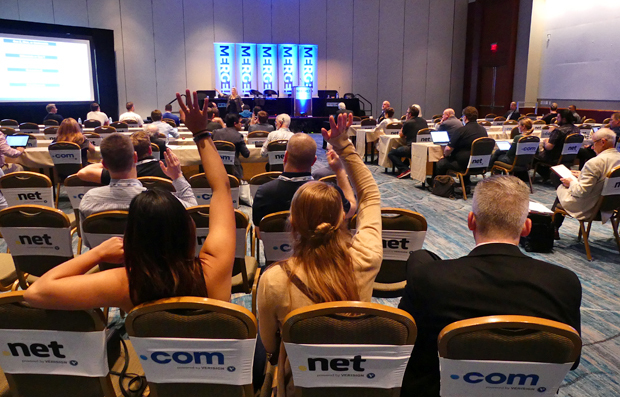 In addition to covering domain names, the unique event also brings together experts (and those wanting to learn from them) from many related fields included Digital Branding, Website Development, End User Experience, New Business Startups, IP Technology, SEO Design, Security, Hosting, Blockchain, CryptoCurrency and more. 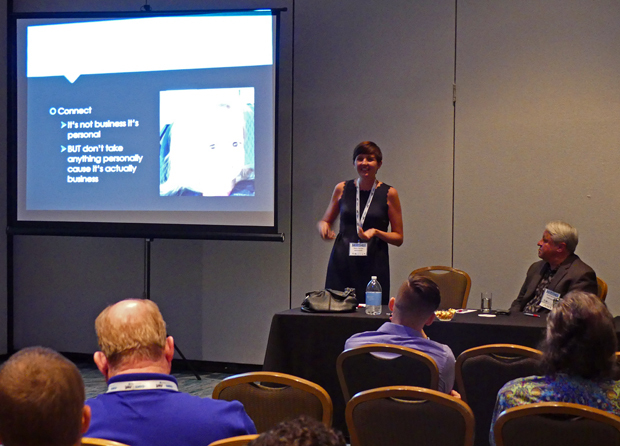 Above & below: The Sunday sessions began with a keynote presentation from Founder & CEO Jen Wolfe of Dot Brand 360. 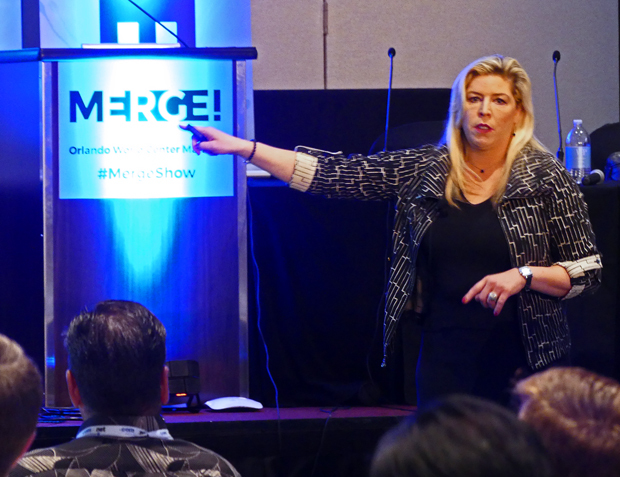 Jen is an entrepreneur, author, digital leader, branding expert and global IP strategist who has written a series of highly acclaimed books including Digital in the Boardroom, Brand Rewired and Domain Names Rewired. Above & below: Larry Fischer (standing, from GetYourDomain.com) revived his popular conference game show - Domain or Not a Domain? at Merge! Sunday. The contestants were (seated left to right) Ron Jackson (DNJournal.com), Dave Evanson (Sedo), Donny Simonton (Voodoo.com) and George Verdugo (Hotels.club). Larry would toss out a series of "domain names" and the competitors had to decide if the names had actually been registered or not. The person who guessed right most often won. I honestly thought I would get smoked by these guys as they are among the smartest in the business but I somehow scored an upset win. Even a blind squirrel finds an acorn once in awhile! 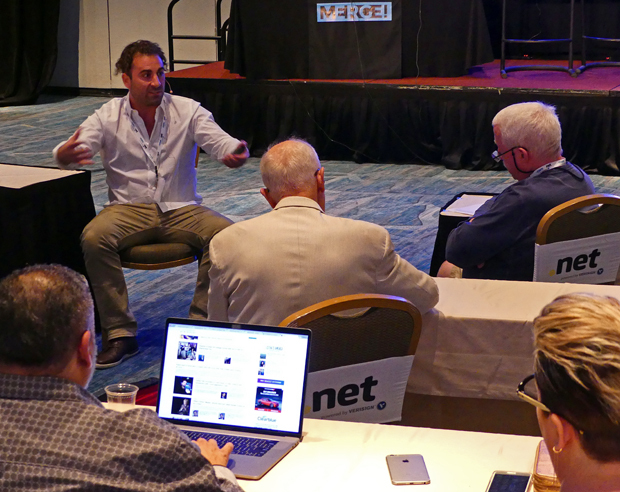 Above: The morning business sessions continued at 11am when Ken Hansen (BlockchainRoadShow.com) drew a big crowd to his session detailing the basics of the red hot new technology in Blockchain 101. Below: At the same time website developers were given a golden opportunity to learn the ins and out of WordPress from one of the leading experts in the field - Brett Napoli of AmbitionInsight.com (at top left). 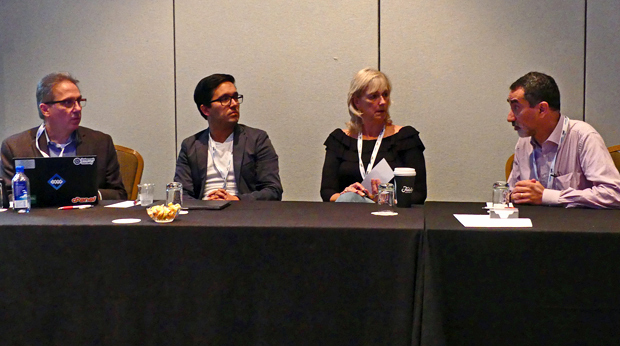 Above: In another meeting room the value, benefits and market values for ccTLDs were discussed in a session that featured (left to right) moderator Joe Alagna (Afilias), Jochen Kieler (BrandIT.com), Ilze Kaulins-Plaskacz (ExcellentDomains.ca) and Alfredo Pinochet (DotLatin). 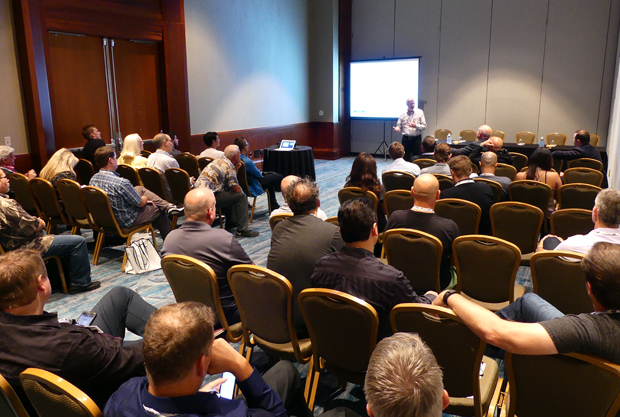 In other 11am sessions, Paul McGrady covered The Legal Nature and Uses of Domain Names and Djamil Legato spoke on Gantry 5 - a cross-platform theme framework for all skill levels. 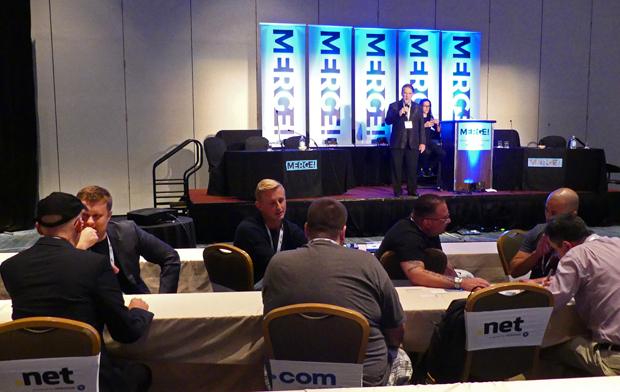 Below: A two-hour lunch break followed the morning sessions and gave attendees time to visit the booths in the Exhibit Hall. One of the most popular ones was set up by Domain Token, again demonstrating the increasing popularity of crypto currencies. 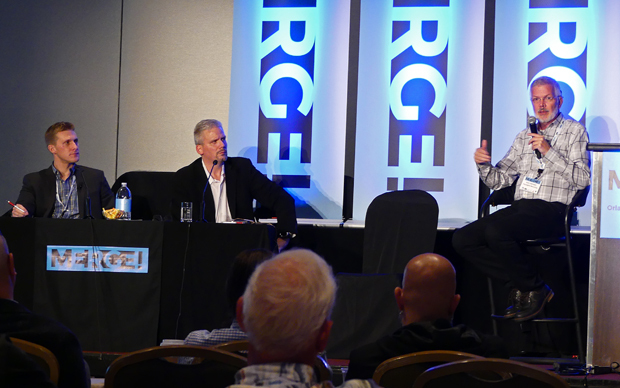 Above: Right after the lunch break, in one of the day's highlights, ICANN Board Member Chris Disspain (who flew in from Australia) was featured in a wide ranging Fireside Chat with moderator Braden Pollock. 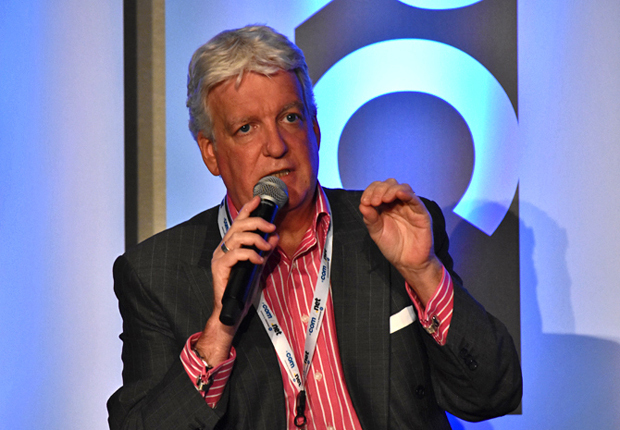 For 16 years (2000-2016) Chris was the CEO of the .au Domain Administration Ltd (auDA), the independent governing body/manager of the Australian Internet domain name space. Sergei Gritsenko followed Mr. Disspain to the stage to give a brief introduction to apartment rental powerhouse Rentberry. 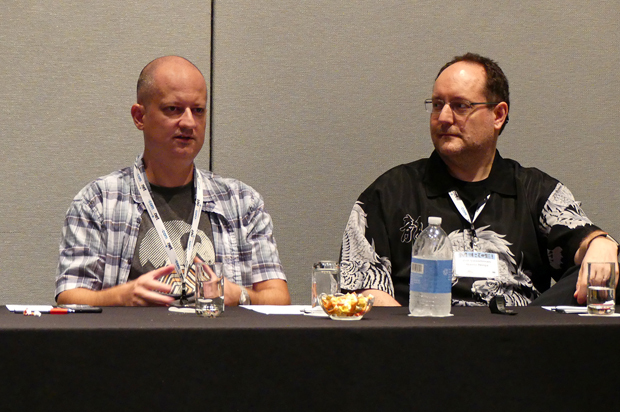 Below: The next round of business sessions started at 3pm including on Ownership Protection and Domain Name Security that featured Theo Develegas (at left, from Acro.net) and Bill Sweetman (Name Ninja). In adjacent rooms others topics being tackled included Organic SEO and Grav CMS. 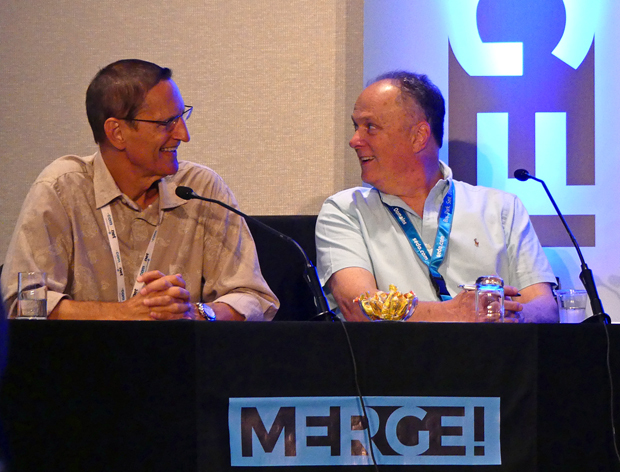 Above: Also at 3pm, Ken Hansen (at right) returned to the stage to moderate a session called Business With Blockchain: Meet Innovators that featured crypto currency experts Bennett Collen, CEO at Cognate (left) and James Drake (CEO & Co-Founder of Embermine). Below: At 4pm, insight into promoting your brand on Facebook was provided by Mary Davies (Beanstalk) and David Szetela (FMB Media). 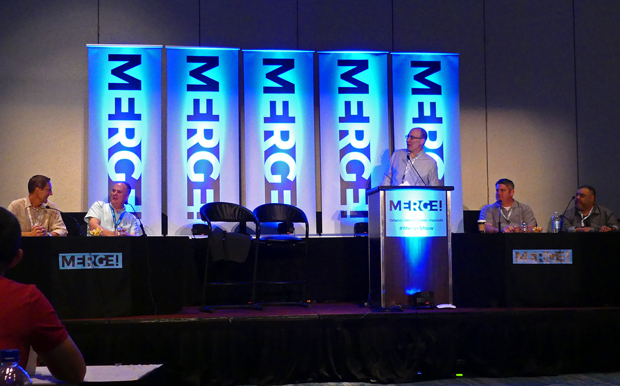 The Registry Premium Domains business got its turn in the spotlight in another 4pm session that featured five experts panelists. On the right side of the dais (above) Moderator Braden Pollock (standing) listens to information provided by Victor Pitts (MMX.co) and Kathy Nielsen (Neustar). 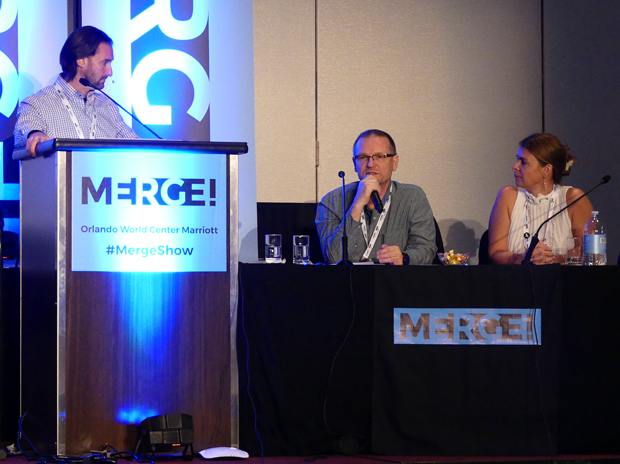 On the left side of the stage (below), left to right, Jay Westerdal (CEO, Feedback), Joe Alagna (Director of Business Development at Afilias) and Christa Taylor (CEO at DotTBA Inc.) weighed in as well. 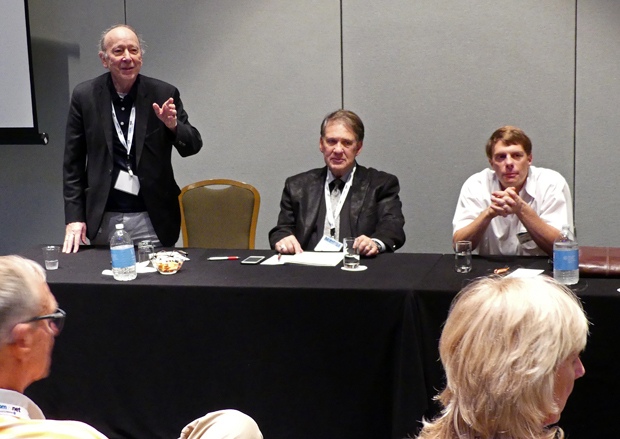 Above: In yet another session in the 4pm hour, leading industry attorneys offered advice on UDRP and Disputes. The panelists included (left to right) Gerald M. Levine, Esq, moderator Howard Neu and Stevan Lieberman (Greenberg & Lieberman). Below: The business day closed with a Speed Networking session in the main hall (as well as a session on Drupal 8 in another meeting room). Above: With the Sunday business day now done attendees were free to spend a night on the town. 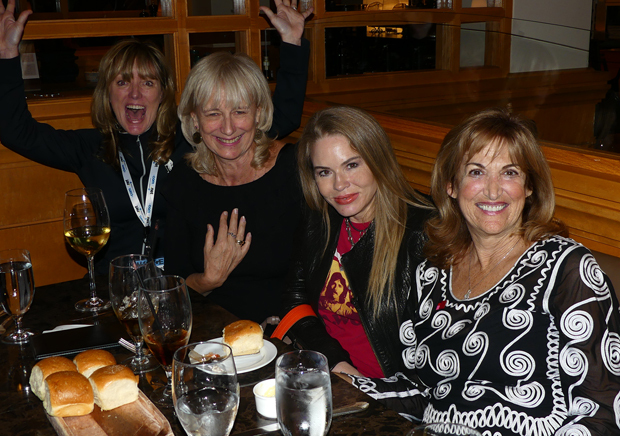 This group stayed nearby for a dinner hosted by Hotels.club and the .CLUB Registry at the Hawk's Landing restaurant that is part of the Orlando World Center Marriott complex. Hotels.club founder George Verdugo is at the head of the table at top right and .CLUB Co-Founder and CEO Colin Campbell is the 2nd person to the right of George. 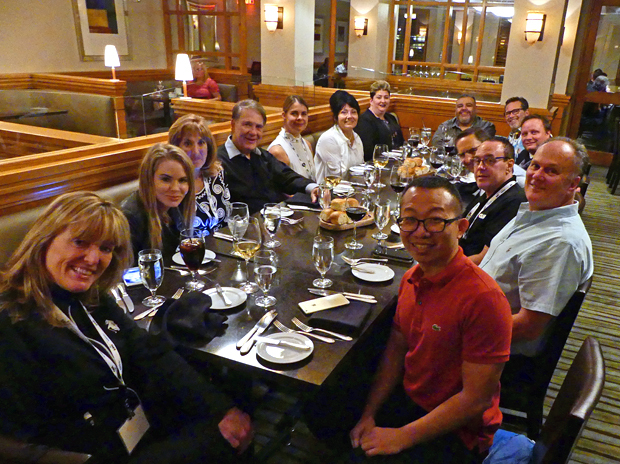 Below: Some of the guests who made the Hotels.club/.CLUB Registry dinner such a pleasure to be part of. Left to right, K.W. Boswell, Ilze Kaulins-Plaskacz, Anna M. Bastian and Barbara Neu. As I write this day three of business is winding down with the night still ahead. I'll have all of the Monday photos and highlights for you in my next post from Orlando.